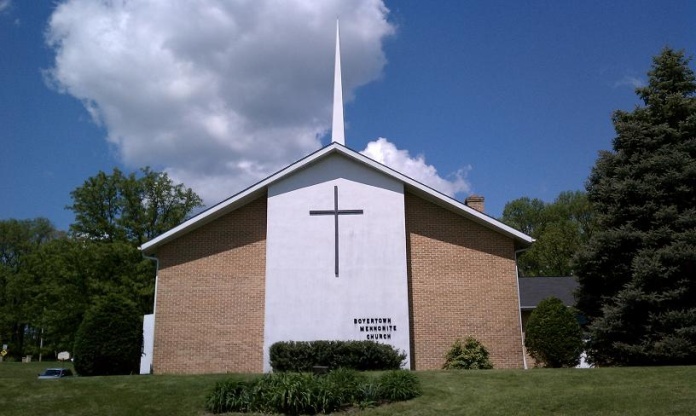 Our congregation was a “church plant” from the Bally congregation and began worshiping in Colebrookdale Township of Berks county in the year 1780. For many years these two faith communities continued to share pastors and many other aspects of church life. It wasn’t until the late 1940’s that Boyertown became completely separate with its own pastor and leadership. Our first buildings were located at the center of Boyertown, but in 1969 we built the present facility on a hill outside the borough of Boyertown. Al Detweiler served the congregation for about 25 years until 1993. In 1995 the present pastor, Nelson Shenk, began serving upon Al’s retirement. The Leadership Team is made up of the pastor, two elders, and two deaconesses who serve the spiritual needs. The administrative body is the Church Council which is composed of the chair persons of various ministries within the congregation. Our mission statement is: “We strive to be a Christian community of healing and growth.” We have become a faith community that ministers to a wide variety of needs within the Boyertown area and have attracted folks with addictions, background of abuse, poverty, etc. Folks have found this to be a place of safety and acceptance. As a result we are very diverse in every way possible. We have been doing several annual events that expose us to our community and provide ministry to those who participate. These include Red Cross blood drives, a community yard sale, a pig roast, a Christmas bazaar, and a Christmas Eve service. We are a very informal, blue collar congregation who has become known for how open we are to many different kinds of people. We pull together to minister to all of the needs of the folks that God has placed in our care.